t*rexes and tiaras: Tuesday Titles 137.. Sometimes, I'll have a book arrive on the doormat which, rather than being added to the ever-growing pile of books I'd love to read when I get time, skips the queue. 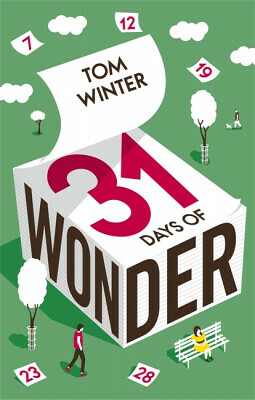 31 Days of Wonder did just that. It hit the doormat one rainy Saturday morning, and I headed back to bed with it once I'd made a cup of coffee...a couple of hours later I'd read it all and could not wait to share it. Alice is stuck in a job, a body and a life which she's not happy with. Ben lives with mental health issues which cause him to say things without realising what he's said until it's too late. One lunchtime, they meet in a park and change each other's lives. From that moment, the narrative splits between Ben and Alice and each chapter begins with a distance (in miles) between them, too. I read with eagerness to find out when their paths would cross again. Ben battles his thoughts and tackles various mental and physical challenges throughout his part of the story and Alice, to a lesser extent, does the same. She has her own internal struggles and I spend several of the Alice chapters willing her to find the internal strength she needs to battle some of the pressures in her world. A really lovely read about overcoming one's challenges, 31 Days of Wonder is published on 10th August.